ONLINE TICKET SALE CLOSE at 6:30pm Day of Show! 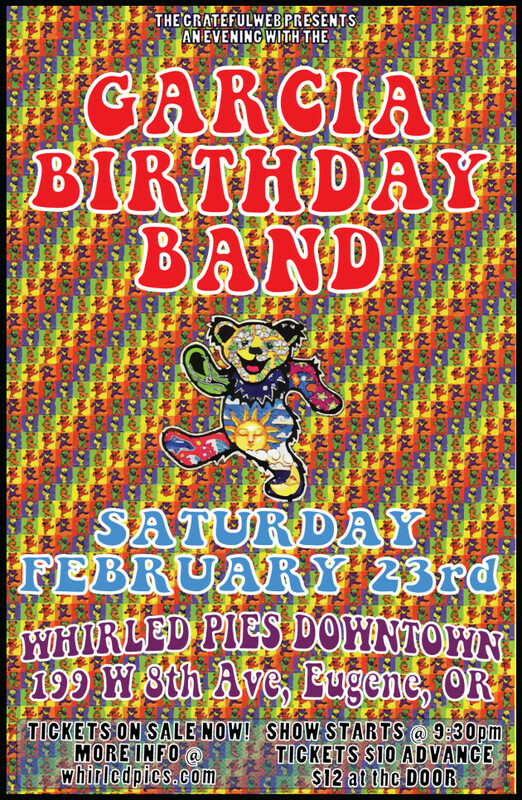 The Grateful Web Presents an Evening with the Garcia Birthday Band at Whirled Pies in downtown Eugene Oregon! Always sure to raise the roof and keep the dance floor rockin’, hoppin’ and shakin’, the band’s quickly growing fan base finds the community spirit and kind vibes contagious! Music-lovers with a wide variety of tastes enjoy GBB’s extensive playlist which includes classics from Bob Dylan, Smokey Robinson, The Beatles, Johnny Cash, Chuck Berry, Jimmy Cliff, Traffic, Dr. John, Merle Haggard, The Meters, Neville Brothers, Buddy Holly, Otis Redding, James Brown, Warren Zevon, Rev. Gary Davis, Marty Robbins, Bruce Cockburn, Phish, and Peter Tosh, to name a few… No two GBB shows are ever alike and the band always strives to bring a true-to-life traditional vibe to each and every performance! With musicians hailing from the likes of New Riders of the Purple Sage (NRPS), David Nelson Band, Kingfish, Cubensis, the Buds of May, the Ike Willis Band, Brothers Jam and LOOS3, the band is certain to provide high musical adventure!